UH ARTS OPEN-Taste of University Heights | UH Arts Assoc. 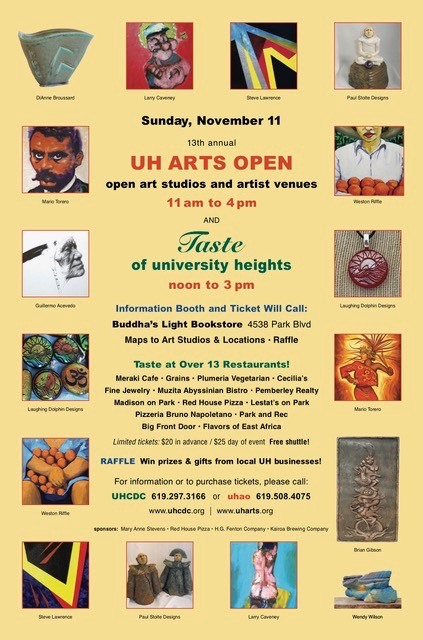 September 16 and 17 2006 declared as "university heights Art association day"
The 13th annual University Heights Arts Open and the UHCDC's Taste of University Heights combine events again this year. Stroll through the quaint neighborhood sampling delicacies from University Heights diverse restaurants and then enjoy a free self guided tour of the arts. Free shuttle tour of artist studios/venues in the area.